Following the request submitted to the local court by Adv. Muhammad Dahleh, who represents the Sumarin Family, the court ordered to freeze the eviction procedures against the family. The main request submitted by Dahleh was to cancel the previous ruling of the court, from 2005, which ordered the eviction of the Sumarin family without any response or defense by the family. Today, the court gave Himnuta, who is demanding the eviction, a chance to respond to the request until the 18th of December 2012. After that, the court will decide whether to cancel the eviction ruling or not. The court ordered that until the decision is made, the eviction procedures will be frozen. It is yet another opportunity for the JNF to withdraw from evicting the Palestinian family from its home in East Jerusalem. The JNF can easily decide not to object the cancellation of the previous ruling and avoid another political crisis in East Jerusalem. […] 2. I hereby give order for the delay the eviction procedures until a decision is issued regarding the cancellation of the court order. 3. 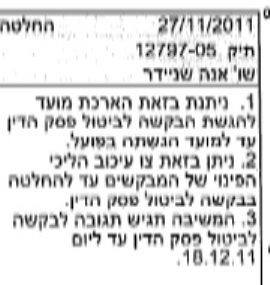 The respondent will present a reply to the request for cancellation until 18.12.2011. This entry was posted on Monday, November 28th, 2011 at 2:58 pm and is filed under Uncategorized. You can follow any responses to this entry through the RSS 2.0 feed. You can leave a response, or trackback from your own site.